Three services are installed with SQL Server Desktop Engine: SQL Server Service Manager, SQL Server Agent, and Distributed Transaction Coordinator. The SQL Server Service Manager Utility is installed with Desktop Engine to enable you to manage these three services. The SQL Server Service Manager window shown in Figure 9.2 displays the settings for Server, Services, and the status of the Service that is selected. The Server and Services fields have drop-down lists to allow you to choose from those available. So, the Server drop-down, for example, contains all the SQL Server instances of which this particular computer is aware. 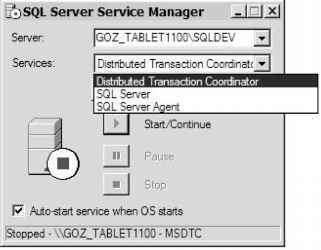 The Services drop-down contains choices for SQL Server, SQL Server Agent, and Distributed Transaction Coordinator. The buttons for Start/Continue, Pause, and Stop are enabled or disabled as appropriate, based on the current status. 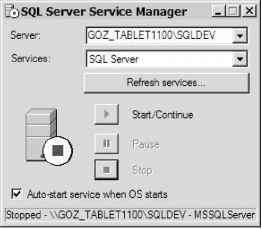 Figure 9.3 shows the status of the SQL Server Service, with Pause and Stop disabled. If you select the Start/Continue button, the SQL Server Service starts running (Figure 9.4). The SQL Server Service is the core of Desktop Engine and all other versions of SQL Server, for that matter. It consists of the SQL Server storage engine and the query processor. The storage engine is responsible for reading and writing the data to the database, and the query processor is responsible for receiving and executing SQL statements. The SQL Server Service must be running in order for data to be retrieved, inserted, updated, or deleted from Desktop Engine. The default installation of Desktop Engine sets this service to automatically run on startup of the computer where Desktop Engine is installed. 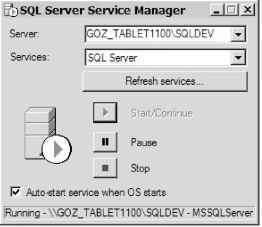 The SQL Server Service shown in Figure 9.4 is running on a server called Goz_Tablet1100 and a database instance called SQLDEV. Notice how the indicator to auto-start the service when the OS starts is checked. This means that the SQL Server Service will start any time the operating system boots. It is a good idea to have this setting turned on for the SQL Server Service so that database inserts, updates, deletes, reads, and so on will be allowed automatically. User intervention is not required to manually start the service each time. The SQL Server Agent is another service installed with Desktop Engine. SQL Server Agent is a service that allows you to schedule jobs and alerts for your database. For example, suppose you want to create a job to run each night to perform a database backup. The SQL Server Agent enables you to schedule this job to run on that schedule. As long as the SQL Server Agent is running, it will take responsibility for running the scheduled jobs or reporting any problems encountered when running them. This service is not required for using a Desktop Engine database, but it can certainly be a useful service. The final service installed with Desktop Engine is the Distributed Transaction Coordinator (DTC). The DTC service allows transactions to span more than one computer across a network using a two-phase commit. DTC is beyond the scope of this chapter, but it is worth mentioning so you are aware it exists. These examples illustrate how easy it is to manage the three services that are installed with Desktop Engine by using the SQL Server Service Manager utility. Now that I have covered the basics of setting up Desktop Engine and starting and stopping the services, let's return to the discussion of using Access Projects to work with SQL Server databases.